Cost: 295,000 Nepali Rupees. At the time of writing, this equates to approx USD $2,700. 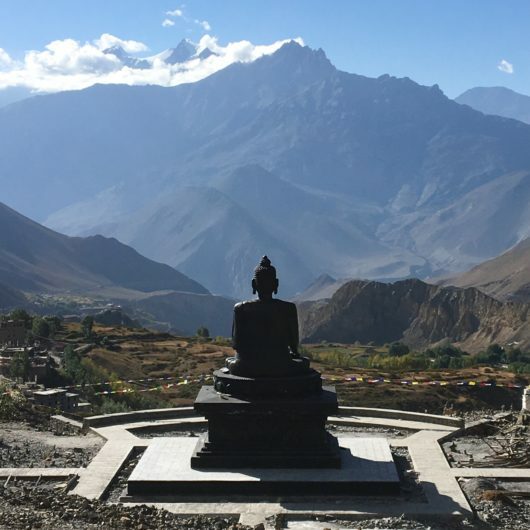 Following his stunning retreat with us in 2017, John Scott is returning to Nepal to take an intimate group on retreat into the ancient kingdom of Mustang. Having adventured there by motorbike after their Nepal retreat of 2017, John and Julia were captivated by the incredible landscapes and energy of his journey. Let us share this with you through a once-in-a-lifetime yoga and meditation retreat. Tucked away high in the Himalayas, light filters along the narrow cobbled streets and ancient mud temples of the peacefully haunting medieval village of Kagbeni, our home for this incomparable Ashtanga retreat. Kagbeni is widely considered “more Tibetan than Tibet” thanks to its preservation of traditions and lifestyles which are rapidly disappearing across the border. There, John and Julia seek to combine the Ashtanga practices and teachings with the extraordinary energy of this remote and inspiring land. Morning asana and meditation practice will be complemented by optional afternoon hikes into the surrounding terrain: the day trips accessible from this base take you to some of the most extraordinary locations on earth. Within this setting, John and Julia will share some of their deep knowledge of yoga philosophies that originated in these mountains. 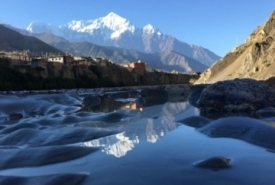 From Jomsom we jeep to Kagbeni in Mustang, one of the last regions where traditional Tibetan life thrives. A quasi-independent Tibetan kingdom until 2008, its timeless culture remains almost intact. 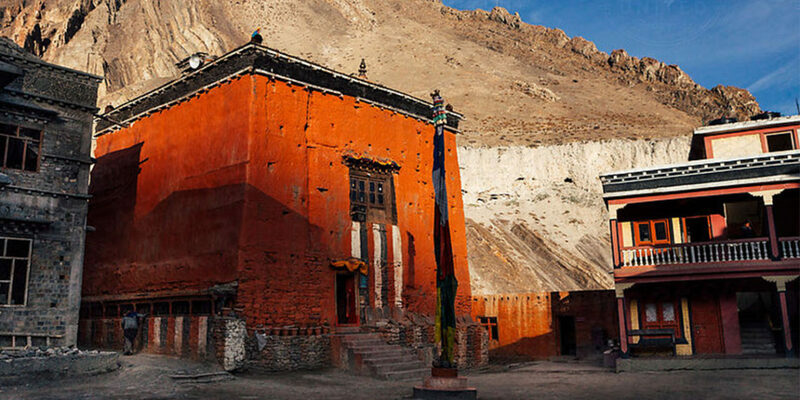 Described as a “cauldron of myth”, Mustang has remained on the periphery of modern life, a stark land of ancient cave homes, deep ravines, pilgrims, demonic myth and profound spiritual peacefulness. 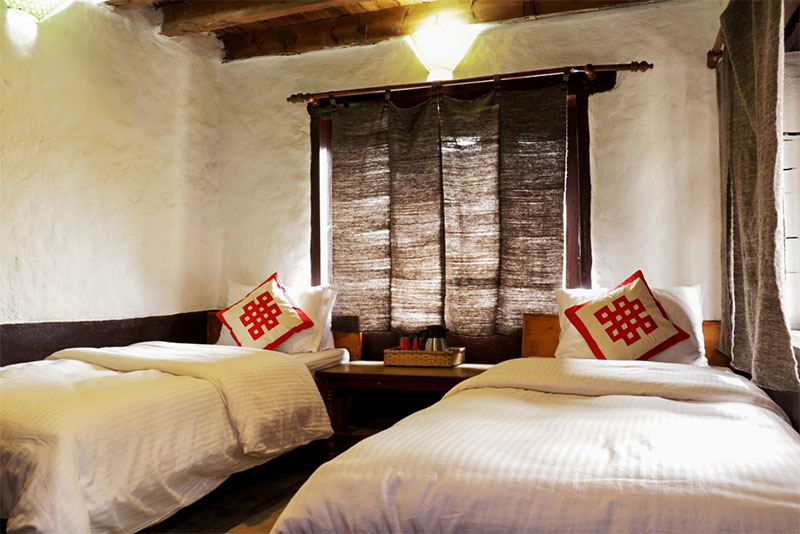 Our home in Kagbeni is the Red House Lodge, a beautiful Tibetan guesthouse with comfortable and lovingly-crafted rooms. The guesthouse has a small private Tibetan monastery with a huge clay idol of Maitreya, and you can share, if you wish, in the ancient Tibetan Buddhist traditions of our hosts. Our life there will be simple: simple organic fresh foods, simple lifestyle, and communion with nature. Feel the demands of daily life shed away and create space for what truly matters to be heard. In this remote mountain landscape give yourself sanctuary and clarity through the peaceful simplicity of Himalayan life. On the last day, 7th May, we will take a dawn flight back to Pokhara to end the retreat. John Scott is a dedicated and direct student of Shri K Pattabhi Jois since 1989. 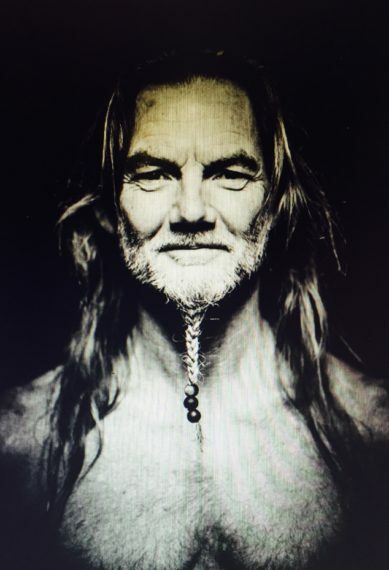 John was introduced to Ashtanga Vinyasa Yoga by Derek Island, while traveling through Europe. 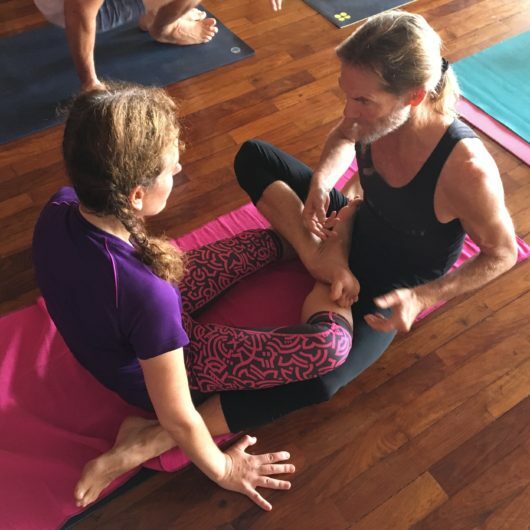 As a result, John began his studies with Guruji – Shri K Pattabhi Jois of Mysore India, and has since then continued to develop his practice and teaching with many other students on the path of yoga. In 1995 John was certified to teach Ashtanga Yoga by Shri K Pattabhi Jois. 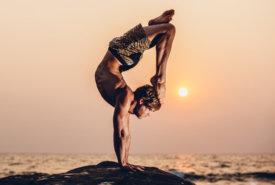 John incorporates design philosophies with yoga philosophies, adding a very precise, detailed and colourful metaphorical presentation to his teaching. Actor, Dancer, and Yogini, at the age of 18 Julia began her yoga journey, first drawn to Iyengar Yoga and Buddhist Meditation. In 2014 however, when Julia was introduced to Ashtanga Vinyasa Yoga, it was apparent to her that this one dynamic practice encompassed all the magic and wonder of a mystical journey of self-expression and discovery. Julia met John in 2016 their two energies fueled a life together of adventure and discovery. 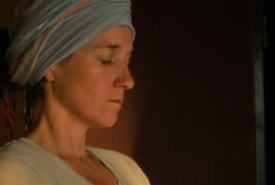 Julia since has balanced two lives, travelling between countries from Yoga Retreat to Acting and between sets immersed in assisting and apprenticing John. In 2017 she completed her 200 hour JSY Teacher Training. When Julia is teaching and adjusting yoga asana, she draws from her multiple disciplines. She incorporates and integrates relationship skills so that the student feels met, held and supported, allowing for their inner expression to be articulated. The fee for the course is 295,000 Nepali Rupees. For an indication of the rate in your currency, see xe.com. At the time of writing, this equates to approx USD $2,700 or GBP £2,000. Payment details will be sent to you on confirmation of your place. We have space for a limited number of students’ companions who do not wish to participate in the yoga but who would like to join the adventure. For these guests, the rate is 260,000 Nepali rupees. Please enquire if you would like to attend with a non-yogi companion. The fee is all-inclusive from when we meet in Pokhara to when we return you there. It includes: return flights from Pokhara to Jomsom*, 6 nights’ accommodation on a twin-share basis (1 x Pokhara, 5 x Kagbeni), the cost and handling of your permits to this protected area, return jeep from Jomsom to Kagbeni plus jeep use for trips, an unforgettable itinerary, 3 delicious meals per day, world class teaching from John and Julia Scott. Once we receive your deposit, we will send you an information brochure to help you plan your trip. But if you have any questions for now, please feel welcome to contact us.